The term parametric roll is used to describe the phenomenon of large unstable roll motion suddenly occurring in head or stern seas. Due to its violent nature, the large accelerations associated with the onset of parametric roll cause concern for the safety of container ships. 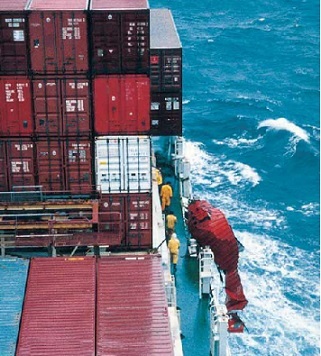 Possible consequences include loss of containers, machinery failure, structural damage, and even capsize. The ship would be traveling with a small heading angle to the predominant wave direction (head or stern seas). Wavelength would be comparable to ship length. Wave height would be large. The ship’s roll damping characteristic would be low. If unfavorable tuning occurs between wave encounter period and natural or twice natural roll period of the vessel, then parametric roll motion can be experienced. Why are large container ships vulnerable to parametric roll ? This is because they have hull forms with pronounced bow flare, flat transom stern and wall-sided mid-ship section. Such features contribute to the variation of the ship’s stability characteristics due to the constant change of the underwater hull geometry as waves travel past the ship. Although this phenomenon has been studied in the past, it has only come to prominence with the introduction of the larger container ships. Until the 1990s, it was considered critical only for ships with marginal stability and fine-lined warships. Parametric roll is an extreme condition for container securing since it combines the effect of large roll and pitch amplitudes. This scenario imposes significant loads on container securing systems. Such extreme roll angles exceed those usually adopted during machinery design. Possible consequences on machinery operation of the ship heeling to very large angles include loss of cooling water suction, exposure of lubricating oil sumps– and hence shut-down of the main engine. a)	Parametric roll is a relatively rare phenomenon occurring in head or following seas, which is characterized by rapidly developed, large, unstable ship rolling. b)	Risk control options exist in both design and operation of container ships that can effectively reduce the likelihood of a parametric roll occurring. c)	Reducing the likelihood of its occurrence is considered a more effective approach than mitigating the consequences. d)	Masters should be aware that, when conditions for parametric rolling exist, the action of putting the ship’s head to the sea and reducing speed could make rolling worse. e)	The North Pacific in winter is known to be an area where conditions for parametric rolling exist. The anti-heeling system developed by the German company InteringTM to prevent the build-up of parametric rolling in head or following seas. Sea-keeping model tests demonstrate that the system can reduce the risk of parametric disturbance by shifting the critical wave threshold to such high values that the chances of ever encountering such a roll during a vessel service life are extremely low. A typical example of a complete ship system will include several pairs of U-shaped tanks and pneumatically controlled air valves, plus a control unit with pitch and roll sensors. The controller detects the starting phase of parametric rolling and tunes the tank water period and its damping characteristics by operating the valves according to the actual ship motion. With the metacentric height reduction of appr. 10%, the system will prevent from excessive parametric rolling in significant wave heights up to approx. 10m event at zero speed. In a case study published by UKMAIB - A container vessel loses 50 containers due to the phenomenon called parametric rolling. The vessel altered course after encountering heavy weather, but conditions remained hazardous. Concern grew as the height of the waves and the pitching and rolling of the vessel increased. Speed was reduced. An exceptional roll of about 30 degrees parted the lashings, resulting in 50 containers being lost overboard and causing the vessel to list to port. The vessel was hove to, and a starboard ballast tank was filled to bring her closer to the upright. Some flooding of forward spaces was caused by wave damage to ventilation pipes when the vessel was hove to, but she reached port without further problems. This phenomenon is called parametric rolling, where the pitching motion excites the natural rolling frequency, leading to large angles of heel. The origin of the problem lies in the hull shape of container ships. They have to be fast, hence the fine lines forward, but also they have to have their deck area maximised, hence the full hull shape aft. An initial angle of heel is necessary to get the mechanism going. This will normally be caused by wind blowing against one side. There will be an imbalance of buoyancy at the aft end with an angle of heel, because one side of the aft end will be more fully immersed. The imbalance of buoyancy will increase when the ship pitches stern down, and conversely the imbalance will be relieved when the ship pitches with the stern up. The rolling motion will be excited if the pitching frequency is similar to the natural rolling frequency. - Bridge crews of large container vessels should be aware of the parametric rolling phenomenon. Changing course and/or speed is a way of separating the pitching and rolling frequencies.